That’s what my wife always tells me, “Turn around when you hit the snow.” She should know. So should I, for that matter. A few years back, in the middle of June, her and I got stuck in a patch of snow that was only 20 yards across. It took us an hour of rocking the V-Strom back and forth and poking the snow with whatever sticks we could find. We dug with our hands, yanked, tugged, pulled, and pushed. My V-Strom had Shinko 705 tires at that time. Although they are considered more of an 80/20 tire, and they do fantastic on rainy pavement, they aren’t very good in snow. I have new tires now. Heidenau K60 “Scouts”, with a knobby 50/50 tread. They actually do very well in snow, but snow is snow and it’s still a slick proposition on a motorcycle regardless of tread. This past weekend, I rode up the Clackamas River Highway east of Estacada, and turned right across the river up Memaloose Road. It was paved the whole way (except for a quarter-mile stretch of packed gravel), which was kind of a let-down. I wanted to get some more off-road practice. Once I was above 3,400 feet elevation, I started riding through patches of snow with bare lanes of pavement where truck tires go. I came to a junction with NF 4550 and it was covered with snow, and both roads leading away had snow as far as the eye could see. So I turned around and headed back down toward civilization. On the way, I saw a gravel road going up a steep, rutted hill. I cut a hard right, stood up on the pegs, and climbed the hill. My Heidenau’s worked great and I navigated the ruts and slope with ease. It wasn’t a long climb, maybe 100 yards, so at the top I did a four-point turn and headed back down. Again, the Heidenau’s did a fantastic job of giving me good grip and control. This off-road stuff is a lot of fun! I wanted to test my new Firstgear Kathmandu overpants in bad weather and that’s exactly what happened over the weekend. Cutting to the chase, the pants performed admirably but that’s not the interesting part of the story. Keep in mind, it’s the middle of March and Spring officially starts tomorrow. March in western Oregon can be mild and meek and pleasant, and it can also be hellish and fickle and tumultuous. So far, it’s definitely been the latter. It was sprinkling lightly when I left the house but I had honest-to-goodness rain within a few miles. My goal was to ride up the Clackamas River highway to the small community of Three Lynx, turn around and then come back home, hopefully through as much rain as possible. I put Pledge furniture polish (“Lemon, mmm!”) on the outside of my helmet’s face shield and shaving cream on the inside, made sure the zippers were all closed on my pants and jacket, donned my Aerostich tripple-digit overgloves, and hit the road. All of my gear worked great, although my hands eventually got cold (which is nothing new). The highest elevation my route traversed was 1,210 feet, just east of Estacada as the highway passed above North Fork Reservoir. I saw snow flakes in the air but nothing was sticking on the ground. It rained off and on, heavy at times, all the way to Three Lynx where I turned around and headed back. This pattern of weather continued, with rain falling at least 80% of the time. When I got back to Eagle Creek the rain turned to big, fat snowflakes and it started to stick on my fairing, arms, legs, and helmet. I used the squeegie on my tripple-digit glove covers to wipe the building snow from my face shield. The snow wasn’t sticking on the road surface but it was sticking on the ground next to it. By the time I got home a few minutes later, I had to wipe the snow from my face shield every 5-8 seconds and visibility was reduced from the volume of snow flakes in the air. Snow had built up on my bike’s fairing and completely obscured the view through it. I had snow over my boots, knees, and covering my arms and shoulders. 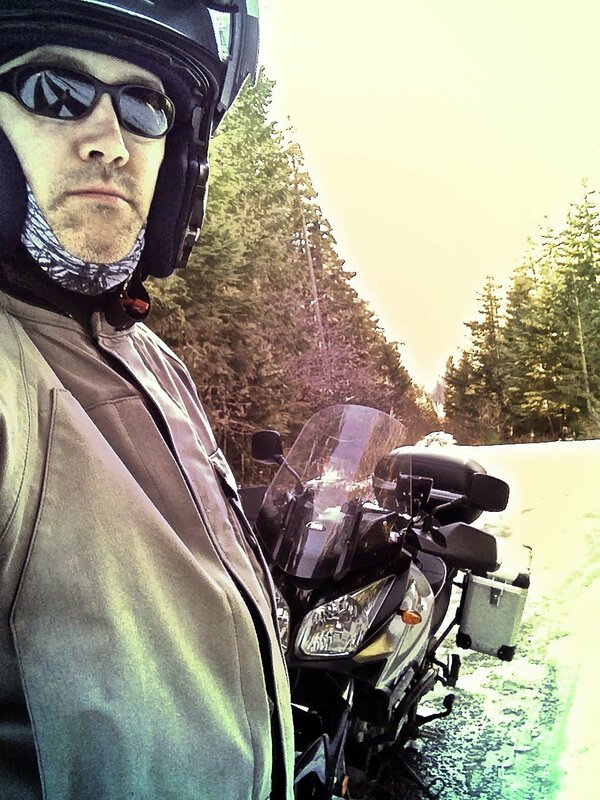 There was also 1/4″ of snow built up on my helmet (only the face shield was free of snow buildup). Within 20 minutes, the sun was shining and the 1/2″ of snow on my front yard was melted and gone as if it never happened. We left the house Friday afternoon and rode back into town before crossing the swollen Columbia River via the I-205 bridge and catching SR14 eastbound. My wife, Corina, hadn’t been on my bike since last summer and our planned overnight trip to my sister’s house outside Goldendale, Washington was a great way to get back into it. The sun was shining and it was forecasted to be the warmest day of the year so far after what has been an unusually wet and cold Spring. We stopped at a gas station/market in North Bonneville for a snack break, then continued to Lyle where we turned north onto highway 142. Riding through the small community of Klickitat, we continued up out of the river valley and onto the breezy plain west of Goldendale. We stopped at the 76 station in Goldendale for fuel and were joined by 10 guys on BMW and KTM adventure bikes. Fueled, we continued east on Bickelton Highway another 30 minutes before arriving at my sister’s house. The next morning, after a relaxing but far too short visit, we backtracked to Goldendale before heading south on 97 for ten miles, then SR14 west to Dallesport where we crossed back over the mighty Columbia. The water was roiling and turbulent in the spillway under The Dallesport Dam, letting out a massive volume of water every second. We rode south on 197 into the tiny town of Tygh Valley before heading west toward another tiny town, Wamic. The only store and gas station in town was abuzz with locals celebrating the store’s 25th anniversary as well as a large group of off-road motorcyclists. They were fueling up during a large rally organized out of Hood River. Rolling through town, we cut off into the woods at Rock Creek Reservoir. Our destination was an unmarked campsight used during deer hunting. The rough gravel road was rutted and washed out in several places and interspersed with many large mud puddles. After a little slipping and sliding, we made it to the campsite. Off the bike, we explored the trees surrounding the camp, looking for a cross we mounted to memorialize Corina’s father who had passed away two years prior. We were pleased to see the cross was still there, no worse off despite the passage of both time and weather. We mounted up and headed back up the gnarly road and made our way back to the highway westbound. Our intention was to ride NF48 to where it linked up with Highway 35 next to White River. About a mile shy of the junction we came to a large patch of snow across the road. There were tire tracks and ruts crossing it and the snow didn’t look overly deep, so Corina dismounted and let me ride forward. Within 30 feet into the snow the bike stopped. The snow was nearly 2 feet deep and the bike high-centered on the skid plate, reducing weight and therefore traction on the rear tire. We rocked the bike side to side to create more space, then dug at the snow with sticks and our hands. The temperature was easily into the 70’s and combined with the elevation we were both sweating and breathing hard, seemingly without progress despite the intense effort. Corina got behind the bike and pushed while I worked the throttle and pushed with both my legs. After a great amount of effort and straining, the bike inched forward about 4 feet before getting stuck again. We had at least another fifty feet of snow drift to cross and we began to wonder of it would be possible. We could see another snow drift just like this one waiting for us 100 yards ahead. With more digging, pushing, heaving, grunting, and groaning, the bike moved slowly forward. We made it through and parked the bike on bare pavement, then took a break to catch our breath. After a brief respite, we rode on to the next drift. Approaching it, our hearts sank. We could see that this drift was even deeper and had no tire tracks through it. Whoever had driven their four-wheel drive vehicle through the first drift had turned around and gone back before attempting to cross the next. Within a mile of a snow-free highway 35, we knew we had to go back across the snow drift that took us an hour to cross the first time. Corina got off and walked while I slowly rolled ahead to the snow drift. I hoped that the rut we worked so hard to cross would be easier to traverse. With a lump in my throat, I gave the bike some gas and entered the snow drift. Halfway across the bike stopped. I killed the engine, then began rocking the bike side to side. The rut was deep enough that the bike was being pinched on the sides, effectively reducing the weight on the back tire and therefore reducing traction. 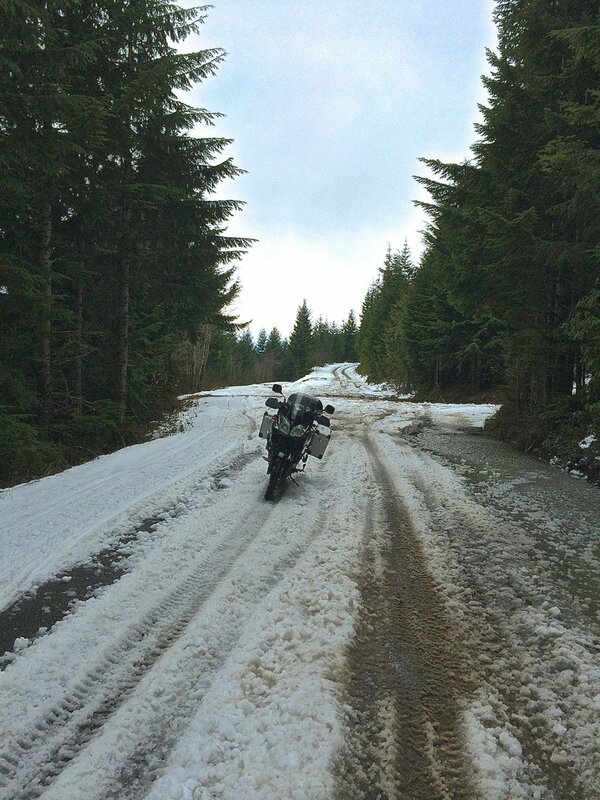 I wondered if attempting to ride across a section without ruts would have been more effective, but the bike probably would have just sunk into the deep snow and stopped. As Corina approached the back of the drift, my effort to clear lateral space around the bike and my pushing forward with my legs while working the throttle was just effective enough to help me inch forward. With a loud “Whoo hoo!” I got purchase on the widened rut we dug out on our way through the first time and emerged triumphantly onto bare pavement. Stopping, I put the bike on it’s side stand and located a small stick to scrape off the snow embedded into every cavity on the bike’s underside. Corina caught up to me and we smiled, still out of breath. We chugged some water, then noticed three off-road bikes from the rally group riding up the road toward us. We waved them to a stop and warned them of the struggle we had just gone through. Even though their tall bikes with aggressive knobby tires would have no doubt had better luck crossing the snow, they decided caution was the better approach and turned around and headed back the way they came. The guys said they would try to ride NF43 and connect with Highway 26. Corina and I discussed that route, but I had run into snow on that route in previous years so we decided we would ride all the way back to Wamic, gas up the bike and grab a snack, then backtrack to Tygh Valley where we would continue south on 197 to highway 216. It was a longer way home but we knew that the entire route would be plowed and snow free. I had just switched from a set of Bridgestone Battle Wing 90/10 tires over to a more 75/25 oriented tire, the Shinko 705. Considering the depth of the snow and the mud and gravel I had ridden so far, the Shinko’s had done a decent job. They also perform great on the pavement, cornering very capably. Back in Wamic, the gas station/store was hopping with off-road rally riders and anniversary celebrants. We struck up a conversation with Sam Cobb, the owner of a small tavern in Tygh Valley, who was present to celebrate the store’s anniversary. Fed and fueled, we said our goodbyes, then worked our way back home. The original route should have been about 160 miles and lasted only four hours. Instead, we rode well over 250 miles and got home four hours later than intended. It was an adventure and we pulled through it together, no worse for the experience. Having a folding shovel on board would have been helpful, but using the most important tool of all – our brains – would have been far more effective. Even if you can see the other side of a snow drift, it can easily be too deep for a motorcycle to cross. Mud puddles are the same way; you can’t tell how deep they are just by looking at them. The funny thing is, when I woke up the next morning, I felt like getting back on the bike and heading right back up into the mountains for another go. I rode to work today. My last ride was Dec. 9th. Almost a month without being on two wheels, and it damn near drove me crazy. It snowed last night, building up a couple of inches at my house, but it turned to rain by 10pm and it was just rain by this morning. It wasn’t very cold, either. 44 degrees in Gresham. The Portland metro area, and the Pacific Northwest in general, is thawing out from one of the biggest and worst snow storms in decades. I had 23″ of snow fall at my house in the Cascade foothills and have a pile of snow several feet high blocking a large portion of my driveway. According to my notes, I haven’t ridden my motorcyce since 12/9, the longest riding drought I’ve had since I bought my bike back in February of 2007. It’s driving me nuts. Now that the snow is gone, the prodigious amount of standing water and sanding gravel on the roadways is the biggest problem. It’s raining to beat the band and there is no sunshine in the seven-day forecast, but I’ll probably ride to work on Wednesday anyway. That will give the road crews enough time to hopefully sweep the main streets. The rain won’t bother me, however. It’s been quite a storm.